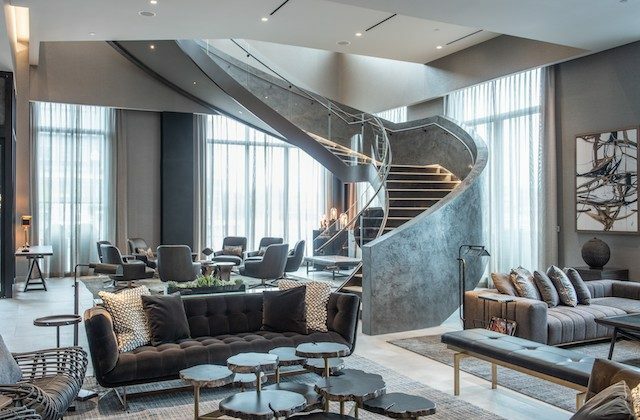 The Row Hotel at Assembly Row Opens in Somerville, Mass. Travelers to the Boston area wishing to stay in the emerging neighborhood of Assembly Row in Somerville have a new option for accommodations: The Row Hotel at Assembly Row. The hotel, which is part of the Autograph Collection, has 158 rooms and seven suites. It is a block away from the Assembly orange line station, three stops away from Boston. “We’re excited to be a part of the vibrant evolution of Assembly Row and Somerville at large, and are eager to provide a new perspective on Boston travel that affords guests the dual benefits of being both minutes from the city and in a neighborhood all its own,” said general manager Michael O’Shaughnessy. The neighborhood’s manufacturing heritage, including the site’s past history in automotive assembly, is incorporated in the hotel’s design. The lobby, with its floor-to-ceiling windows, offers a sense of expansiveness, while anchored by a sweeping spiral staircase edged in glass and galvanized metal. Sculptures made of glass prisms and lenses on top of reclaimed automotive parts interact with light refractions. A restaurant in the lobby lounge, Reflections, offers seasonal fare.